Next batch starts April, 2019. Live classes plus bootcamp. 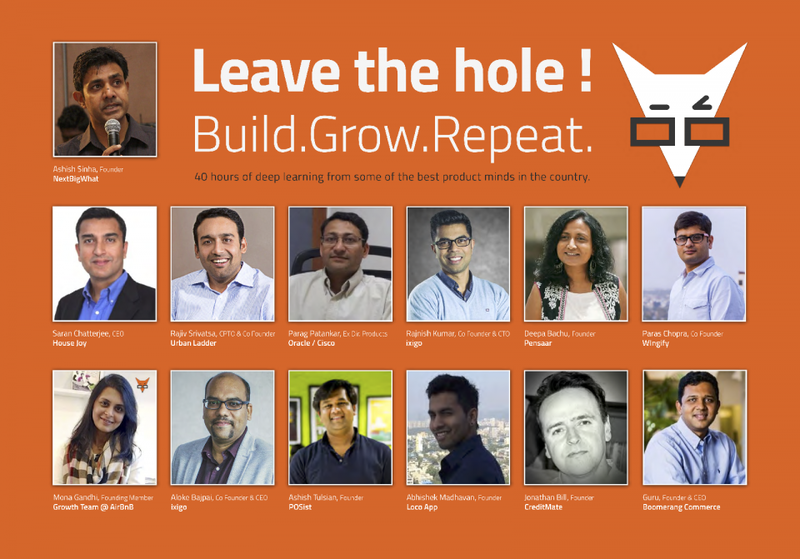 Bootcamp in Bangalore - Two days bootcamps. You will Implement all you have learned. Bi-weekly call with the instructor to answer your queries or help with career related questions. We offer EMI payment options (via our partners). We run one of the largest product communities and conferences - you will be part of that. 200+ topics, 15+ guest speakers. Multiple perspectives. Well, we have got you covered. Optimized for practical learning. The course has been prepared in consultation with leading product leaders and tech entrepreneurs. We help you upgrade your career and prepare you for product management interviews. Most importantly, we connect you to companies hiring PMs. Evaluating Ideas. Doesn’t matter whether you are launching a startup or launching a new product in your company, evaluating ideas needs a certain framework and models - you will learn that. Test product positioning and messaging. With minimal budget, how can you test the product hypothesis? Equip you with essential analytics and frameworks on product marketing. We deliver more RoI than anybody else. You will learn from 15+ product leaders, ensuring that we bring to you multiple perspectives which will help you get holistic knowledge. 10 Online Live Sessions and 2 Classroom Sessions (Delivered in Bootcamp / Workshop format). 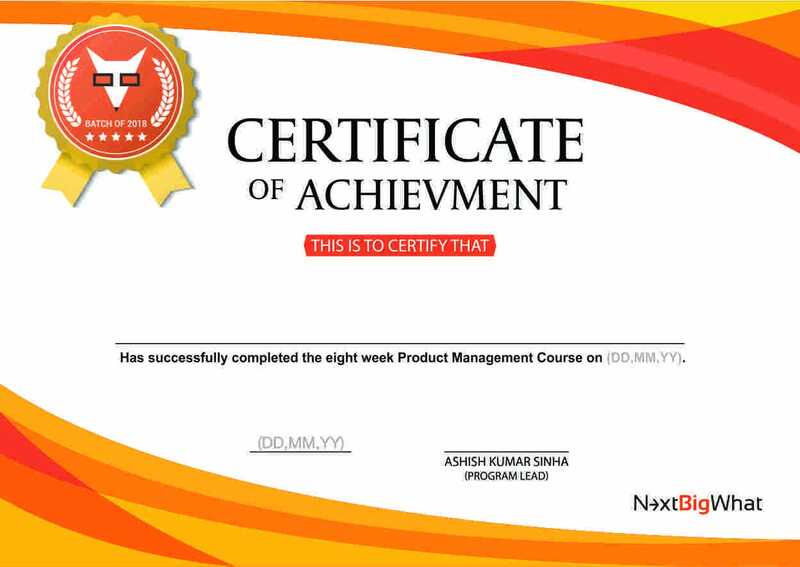 You will receive Product Management certificate. The NextBigWhat Academy certification is recognized by top tier product companies. ""The course greatly exceeded my expectations. It covered the absolute fundamentals of a PM role such as using solid frameworks that you can bank upon to define your product, developing personas and user stories, understanding metrics, product marketing, PMF etc."" Learn. From wherever you are. 200+ high quality reference materials for later reading. Mentorship Calls with the course instructor. You won't. You will never lose any session. You will have access to the recorded version of the session in your LMS. What if I can't attend the offline class happening in Bangalore? Don't worry. You will have access to the recording or an option to attend the session in the next batch. Early birds also get to avail the NextBigWhat Academy Scholarship. The Course Fee is Rs. 75,000 Rs. 50,000 (+tax). The 30% scholarship has been incorporated in the payment widget below. Need time to decide? We understand that you'd need to decide on the payment details and still like to avail the scholarship! We have made it easier for you. You can make an advance payment (valid for one year) of Rs. 5,000 and decide on the payment process later (use this link). PS: We also support EMI options (available during checkout process). You can get in touch with us for details on this. The 12 weeks course has been designed in consultation with 25+ product leaders and founders. It will cover the following core modules. We walk you through the GTM process and mistakes often committed by product teams (and how to keep an eye on this). Essentials of product marketing: Fundamentals, Analytics and Frameworks of Product Marketing every product manager needs. Founder, NextBigWhat. Ex-PM @Yahoo, Ketera, Newscale etc. Ashish is an engineer turned product manager turned entrepreneur. He was part of the team which built one of India's first application server. He has been into product management space since 2006 and has worked for several companies including Yahoo, Newscale, i2 and Ketera. He has been instrumental in driving product thinking among startups and several product companies. We strongly believe that a great product management course should bring perspectives from many stakeholders - from the founders who have cracked product-market-fit to product managers who have scaled the products to new levels. Not 1, 2 or 3, but we bring you more than 20+ guests with amazing perspective on builiding great products. We partner with most amazing product companies who are hiring product talent and make the opportunity available to you. You will work with a mentor to prepare for interviews. The PM course is ideally for those who are either willing to get into PM role; or have been performing PM role informally and need to go deeper and get a formal training.